^ Tom Holland Confirms Popular Fan Theory: Spider-Man Was In ‘Iron Man 2’.HuffingtonPost.2017-06-26.[2017-06-27]. 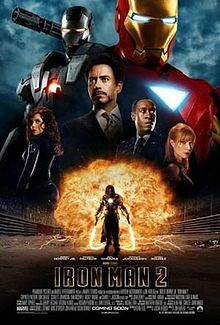 ^ Iron Man 2（亞馬遜書店產品介紹頁）. Amazon.com. [2010-05-02]. ^ 4.0 4.1 EXCLUSIVE: BEHIND THE BOARDS – Mike Fraser (Issue 15 Preview). Abort magazine. 2010-02-10 [2015-04-17]. ^ 李子凡. 《鋼鐵人2》攻台 1晚賣1600萬元. 蘋果日報. 2010-05-01. ^ 李世珍. 《阿凡達》特別版合體淘金 11億霸2010全台票房. 蘋果日報. 2010-12-17.